Native plants host larvae, insects and other beneficial organisms that help sustain the web of life. Birds help pollinate native plants, disperse their seed and eat insect pests. Native plants help reduce flooding water by absorbing more water than traditional lawns. Native plants provide food and shelter to a variety of birds. A native plant hedgerow or garden will maintain a steady population of beneficial insects. These insects don’t care if their prey is on an edible plant or on an aster. 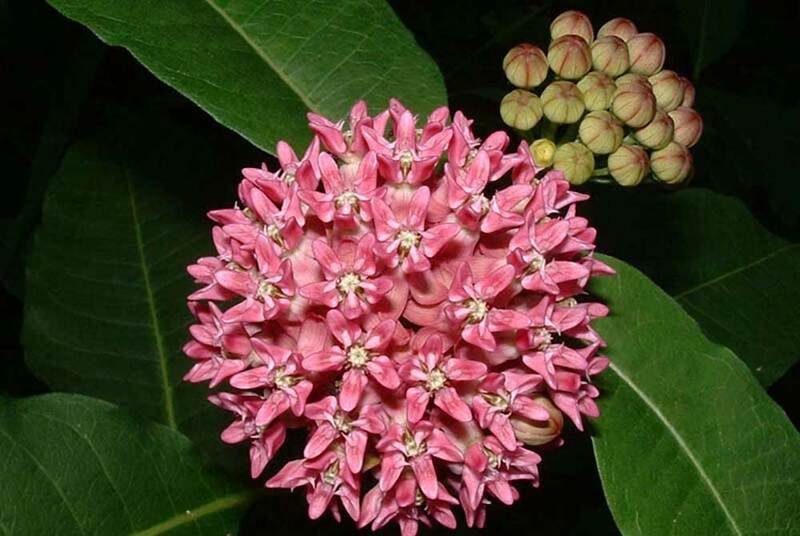 Native plants support many different kinds of herbivorous insects, which in turn attract natural enemies, such as predatory and parasitic wasps, birds, ladybugs, beetles (many species’ larvae are voracious ground predators consuming root pests), lacewings, Ambush bugs, etc. Native plants attract pollinators, particularly native bees. You should have plants blooming in the early spring through fall because pollinators are active then, and they all have differing times of emergence which will overlap with your flowering vegetable plants (such as tomatoes, squash, etc). Native bees are more efficient pollinators than honeybees (we love those too--native bees just are understudied, underappreciated and under-resourced). These bees actively collect pollen. Having native plants present means you support native bees that have specialist relationships with native plants. Some bees can only use the pollen from the Helianthus genus to feed their larvae. Squash bees are a native bee and the best pollinator for squash. When these populations are not supported, people often either do not get squash (zucchini, etc) or they must hand-pollinate to ensure squash producing plants. With a native garden, it’s best to do minimal maintenance in the fall that ensures beneficial insects overwinter and emerge with healthy population levels in the spring. Vegetable gardens often need to be cultivated and plant material removed, which can destroy beneficials, as well as pests (although that practice is changing as long as plants were disease-free). Having a section of natives acting as a refuge can help to mitigate the impact on your beneficial populations. Undisturbed areas also provide nesting and overwintering sites for the effective native bees. If your native hedgerow is near your edible garden, or if you interplant native plants, you can also improve the soil, increasing soil biodiversity, adding organic matter, which increases water holding capacity. Many native plants have extensive roots systems that tend to go downward 10+ feet, and every year, some of those roots die back, adding organic matter. The roots also penetrate down into the soil creating water channels; the more organic matter you have, the more water holding capacity of your soil, which means for you, less extra irrigation. Some native plants also are nitrogen fixers, and also attract pollinators. Partridge Pea is one of those plants, one of our few annuals, and of short stature. To assemble the list below we used: Plants for a Future. There are many ways to start using native plants in your garden. Your garden can be attractive aesthetically and ecologically when you use native plants. You can start to incorporate native plants into your existing landscape – or – you can start completely from scratch. First, make an assessment of the environmental conditions (shady or sunny, drainage, soil types, irrigation, etc.). Also, make an inventory of your existing plants. Understand your site and select appropriate plants. 6 hours or more of direct sun is full sun. 4-6 hours is considered part sun. 2 hours (the light should be dappled) or less is considered shade. We will assume you have the typical clay/loam Oak Park soil. Does water collect where you plan to put the garden? Or is it relatively dry? If it stays wet, in a depression or is near a downspout, you can select plants that prefer more moisture. If it is a drier or hotter spot (near a sidewalk), you should select plants that prefer well-drained and dry soil. If you are removing lawn, there are two options after you create the outline of your garden. First option: You can physically remove the lawn by simply digging a few inches down, pull up strips of lawn, shake off the soil, and you can place the grass in a compost pile or even use as a kind of mulch if you place them with the roots up to the air. Second option: The easiest method to start a new garden is to use sheet composting or lasagne bed, which is simply layering browns and greens on a bed of cardboard, in the fall. First make sure you have mown the area. Place down cardboard and wet it thoroughly. Then place a layer of leaves, then a layer of greens (lawn clippings are great), and so on till you have a pretty think bed. Water these layers. Add a layer of mulch on top. Over the fall, winter, and spring, all of the decomposers in the soil will be working and by late spring you can plant into your new garden. All of the ingredients may not be thoroughly composted, but they are usually enough so that you can plant. As the temperatures warm up, the materials will be consumed and turned into soil soon enough. If weeds are a big problem, you may want to consider not only hand-pulling, but maybe even covering them with a sheet of clear plastic for several months – a process known as solarization. Other methods to kill weeds are pouring boiling water or vinegar on them. By eliminating weeds first, as much as possible, before planting, it will be much easier than trying to control them in a newly planted site. Just as a note, methods that involve solarization, vinegar, boiling water may also kill the beneficial life in the soil. If you use those methods, allow some time for pH of the soil to return to normal and consider adding good compost or healthy soil from other areas of your garden to help repopulate your soil with beneficial microorganisms. Choose species based on the soil, light, and water conditions of your site and for the size, shape, texture, and color you desire. You can look at our Top Ten Lists for different conditions (under the Learn tab in the Main Menu). You can purchase plants from our Native Plant Sale or look at other plant resources here: Where to Get Native Plants. Place your plants in your garden in their pots and arrange until you are satisfied. Be sure to allow for them to mature and fill out. Plan for 12″ between narrow plants (like liatris) or 18″ inches for larger plants (like coneflowers). It is desirable to plant densely; plants support each other, shade out competing weeds, and offer cover for beneficial insects. Once you are satisfied with your layout, plant them. Dig the hole a little deeper and wider than the pot or the root system. Gently tip the pot over to the side and ease the plant out. Place the plant into the hole, start to fill in the hole. After the hole is filled halfway, sprinkle some water to help the soil settle and reduce air pockets. Continue to backfill the soil, and keep a little berm around the plant to help hold and collect water around the plant. Water well. Generally, there is no need to fertilize. Your native plants will need time to become established. The critical period for watering and weeding is two to three weeks after planting – or longer if you are planting in warm, dry seasons. If you are planting trees or shrubs, apply a four to six-inch layer of organic mulch around them (but, not touching the main stem) and a one-inch or less mulch layer for perennials. Mulch can help control weeds, reduce temperature fluctuations, help retain moisture and give a finished look to the landscape. Native plants usually do not require fertilizer. Many thrive in poor soil and applying fertilizer could chemically burn them, or stimulate either lush or spindly, weak foliage growth with few flowers. Leaving the organic matter in the fall and spring is all you need to do. This material will feed the soil organisms which will then feed your plants. Fungi are critically important for the health of your plants, and they prefer whole material to consume. If your plant suffers transplant stress, you can place a container or something to help shade the plant from the sun until it has settled into its new home. Be sure to keep the area weeded and watered appropriately. All transplants will need watering on a regular basis for the first month. If it’s hot and dry, you might need to water daily even for drought tolerant plants for the first week or so. Then you can try to water every other day. Then the third week see if you can stretch out to two full days, and continue till they no longer need supplemental irrigation. Mulch is essential at this stage of your garden to help conserve water, feed soil organisms, and suppress weeds. As your plants mature, keep the plant material in the garden and use a light layer of leaves as a mulch. They will naturally feed the soil organisms which then feed your plants as well as preserving beneficial insects that overwinter. Enjoy your garden, and the real satisfaction comes from watching all the changes and paying close attention to the life that will discover and flourish in your living landscape. Each year add more native plants. Make more prairie and/or woodland spaces. Educate your neighborhood by example! Once you get started, it becomes easier and easier every year to maintain your property/grounds — less mowing and watering; more wildlife and soil improvement. Enjoy the butterflies and birds that visit!